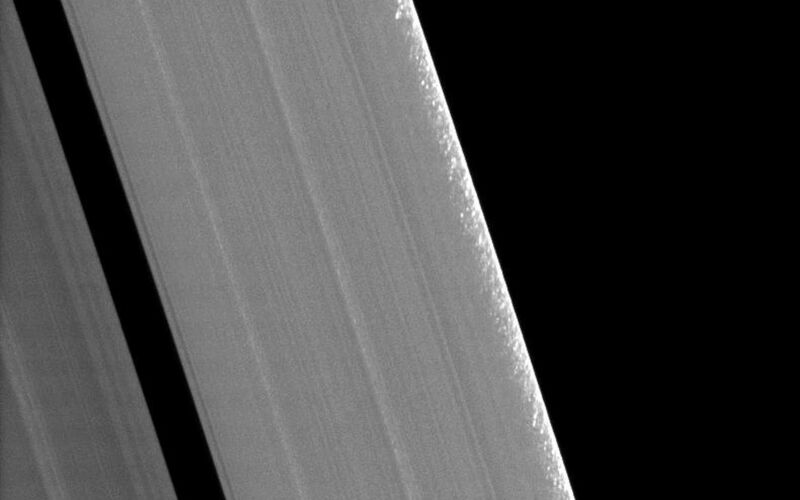 Clumps of ring material are revealed along the edge of Saturn's A ring in this image taken during the planet's August 2009 equinox. 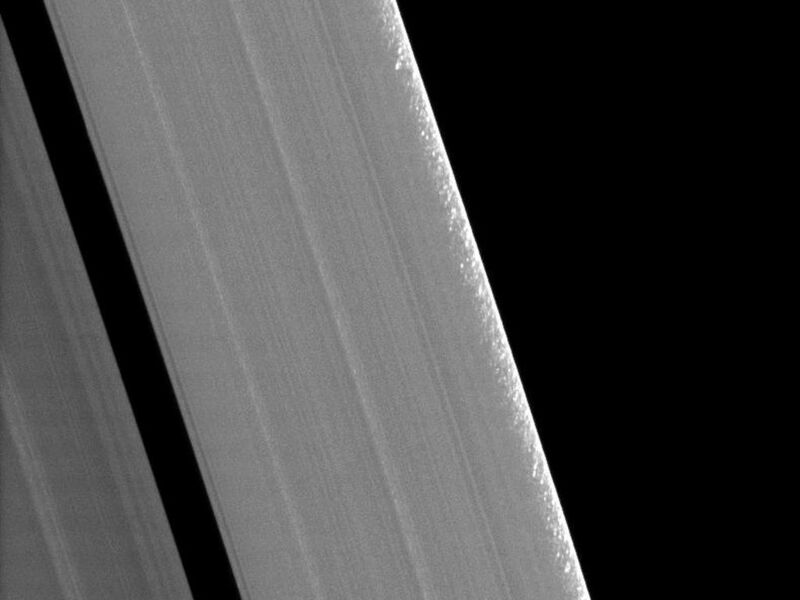 The granular appearance of the outer edge of the A ring, first discovered soon after Cassini's orbit insertion, is likely created by gravitational clumping of particles there. As ring particles round the planet in their orbits in this particular region, they become perturbed by the gravitational forcing of Saturn's two moons, Janus and Epimetheus, whose gravitational resonance at the A ring's outer edge periodically forces the particles close together, promoting clumping (see PIA09892). The individual clumps in this image are a few kilometers across, with the largest being about 10 kilometers (6 miles). Similar clumping is seen at the outer edge of the B ring where a resonance with Mimas has a similar effect on the ring particle orbits (see PIA11665 and PIA10421). This view looks toward the southern side of the rings from about 18 degrees below the ringplane. 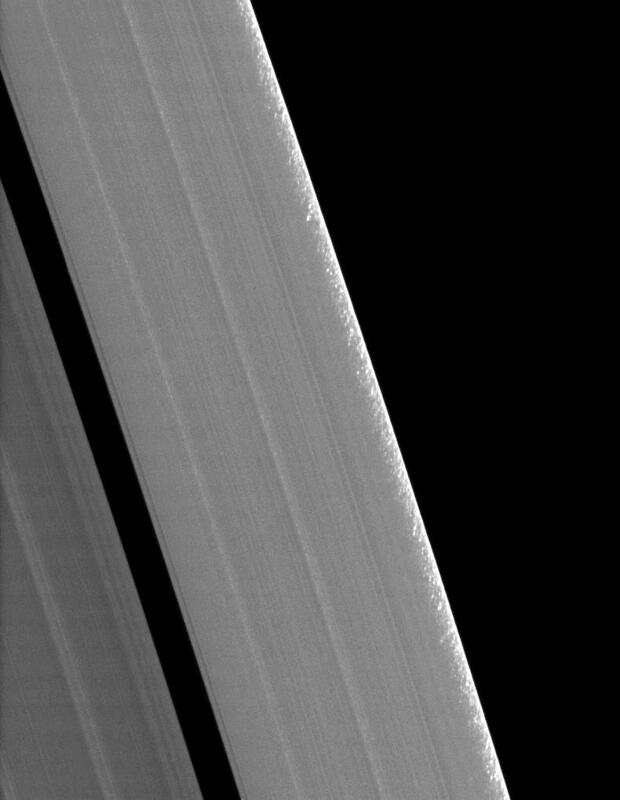 The image was taken in visible light with the Cassini spacecraft narrow-angle camera on Aug. 11, 2009. The view was acquired at a distance of approximately 190,000 kilometers (118,000 miles) from Saturn and at a sun-Saturn-spacecraft, or phase, angle of 94 degrees. Image scale is 780 meters (2,560 feet) per pixel.